Ever notice how everybodies barn looks the same. There is a reason for this. It is the natural consequence of the matrix created by lining up 12'x12' stalls side by side and running a 12' Center Aisle down the middle. For most, the subsequent design is a logical, and thus, an acceptable outcome. But to others, it is just plain boring. So, for those "others", Karl offers The Asymmetric, a barn/apartment that, on the outside appears to be a random arrangement of outbuildings, that overtime, were cobbled together to create a single and unique unit. And though the character of this barn lies in its implications of a sense of history, it still manages to demonstrate it's contemporary nature with specific styling features. Thougtfully organized around a Center Aisle are seven Stalls, a Wash Stall, a Gator Garage, Grain Room, Hay/Storage Room, and a Half Bath. In addition on the Main Floor Level, is a Tack Room with Laundry and stairs to the Apartment above, and a one car Garage. On the Second Floor, the apartment features two good sized Bedrooms each with private Bath, a U-shaped Kitchen with eating bar, Dining Room, and Livingroom. Additional features upstairs are walk-in-closets, a whirlpool and walk-in-shower in the Master Bedroom, a Laundry Closet, and an exterior Deck. This "center out" design makes variatiions on the basic design easy. 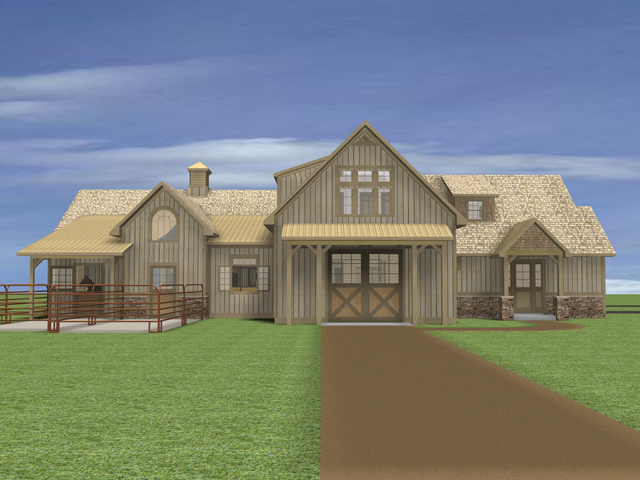 So, for instance, a two car Garage or a larger Tack Room could be substituted without any impact on the overall design. If you would like to see this design in greater detail, give Karl a call and set up an appointment.